When the heavens open up and flood gardens and roads, you rely on storm water drains to deal with the excess water. The house on the far side of the road was totally flooded during a major downpour. The question is, whether the house was built with sufficient drainage to be able cope with all the storm water. Property owners are responsible for the removal of storm water from their property. They may NOT simply discharge excess water onto adjacent land or into the street unless this is permitted by neighbors and/or the local council or municipality. The law is very clear on the issue of stormwater disposal, although sites used exclusively for “dwelling houses” and dwelling units (defined as “one or more habitable rooms and provided with sanitary and cooking facilities”) are not as carefully controlled as larger buildings. Note that a dwelling house is (in terms of the legislation) a single dwelling unit and any garage and other domestic outbuildings that are situated on the site. A dwelling unit contains one or more habitable rooms and it provided with both cooking facilities and adequate sanitary facilities. The legislation also states that the “means of stormwater disposal” used may be addition to, or in combination with any drainage that may be required in terms of F4(2). SANS 10400: Part F Site Operations is described in more detail in the section on site operations on this website. The relevant section – 4(2) – is also discussed below. These legal requirements will be “deemed to be satisfied” if the stormwater is provided in accordance with SANS 10400-R (the SANS drawn up by the SABS for “The application of the National Building Relations”, Part R), which is available from the SABS online store for R174.42 incl. VAT. SANS 10400, Part R deals with all types of stormwater disposal, including rain water from gutters, downpipes, roofs, and paving, and any other excess water that may accumulate on the property. It refers readers to Part H, Foundations stating that it is essential to have good, effective drainage of areas that are in close proximity to buildings, to ensure that ground movement is minimized. The focus of Part R is on the disposal of stormwater on individual sites, but also included interconnected complexes that have multiple dwelling units, including both cluster homes and retirement, village-type properties where management of common property is often controlled by a management body of some sort. The rational design of these systems – if required – must be undertaken by “a competent person involving a process of reasoning and calculation and which may include a design based on the use of a standard or other suitable document.” The concept of a competent person is discussed in some detail in another article. However Part R states that a competent person required for stormwater system designs must be a civil engineer who is registered in terms of the Engineering Profession Act 2000 as a professional engineer or professional engineering technologist. Alternatively this person must have a tertiary qualification (a degree or a diploma) in civil engineering. The legislation (the Act itself rather than the deemed to satisfy rules compiled by the SABS) states that it is the right of the local authority to demand that storm water disposal is provided in accordance with “an acceptable rational design prepared by an approved competent person” So if your local authority is of the opinion that a qualified person should design a stormwater disposal system for your property they must notify you (or the owner of the property) and explain their reasons in writing, and demand that plans and particulars of “a complete stormwater control and disposal installation” for the site and any buildings on it, are submitted for approval. The legislation states that the regulations should not be interpreted specifically as requiring roof gutters and downpipes if another suitable means of drainage has been provided to remove or disperse rainwater from the roof of the building. There are alternatives that architects sometimes prefer. As always, the deemed to satisfy rules take this further. These state that any stormwater that emanates (or flows) from the roof, paving or any area that is in the immediate vicinity of a building shall not cause damage to the interior of the building, its structure or its structural elements. Steps must be taken to ensure that water does not accumulate in a way that “unduly inconveniences” the occupants of any building. Ultimately, all drainage must be shown on plans submitted to the local authority, and it is up to the local authority to decide whether these are suitable and adequate for each individual site. Also, it is the decision of the local authority whether stormwater may discharge into a stormwater system that is provided for a public road, or any servitude, or onto the street. One of the major issues is people simply discharging their stormwater onto neighboring properties. While the Building Regulations do not state that this may not be done, the Building Regulations do give very clear guidelines for stormwater control and disposal, and these DO NOT include the discharge of water into your neighbour’s garden! In addition, both major and minor systems must be designed to cope with design flood recurrence intervals of both 50 and two years. At present there is legislation that requires flood lines for “townships” to be determined for 100-year recurrence intervals. This is because the storm water flow from 100-year floods is typically 25 percent greater than for 50-year floods. Part R states that major storm systems can be designed for a 50-year flood provided that the certified 100-year flood lines remain unchanged. This is very important. There is also a table that specifies minimum stormwater pipe gradient in relation to the diameter of the pipe. So if the minimum 300 mm pipe is used the desirable minimum gradient is 1 in 80, and the absolute minimum gradient is 1 in 230. If the maximum 1 200 mm diameter pipe is used, then the desirable minimum gradient is 1 in 520, and the absolute minimum gradient is 1 in 1500. There are some important specifications that relate to gutters and downpipes, including a table that gives roof, eaves and valley gutter sizes. In summer rainfall regions, the internal cross-sectional area of a valley or gutter per square metre of the roof plan area served (per square mm) is 140; in winter rainfall regions this is 80; and in areas where it rains all year round, the figure is 115. In addition, the internal cross-sectional area of downpipes shall be not less than 100 square mm/square m of roof plan area served by such downpipe, or 4 400 square mm. Part F4 deals with preparation of a site that is to be built on. Point (2) states that when a building is to be erected on a site that is waterlogged or saturated with water, or where any building is going to be situated so that water will drain naturally towards it, drainage must be provided to direct the water away from the site or building, to a storm water drain, or somewhere that it can be disposed of in some other safe and approved manner. Note that these requirement are in addition to Part R.
This part of SANS 10400 is dealt with elsewhere on this site in the section on Roofs. Waterproofing and runoff are dealt with in some detail in the relevant SANS for The application of the National Building Regulations. SANS 1200 LE – Standardized specification for civil engineering construction Section LE: Stormwater drainage. 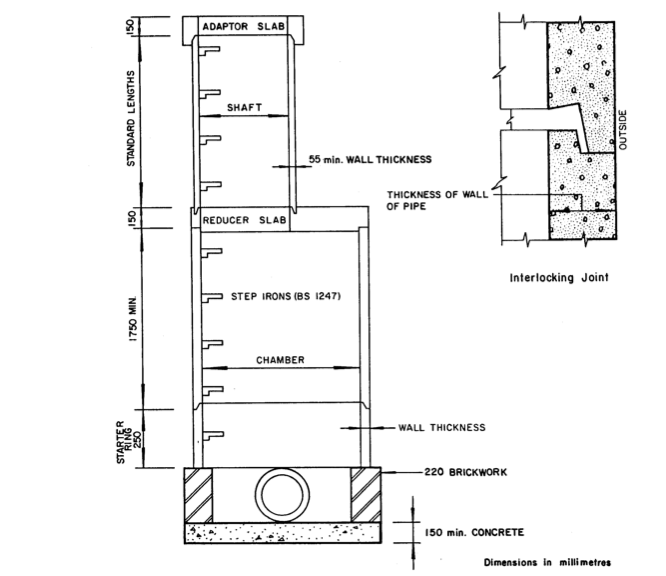 This is a drawing from the above SANS that shows how a precast concrete manhole for storm water should be built. Hi, please can you help. I am in a complex with enclosed gardens. Three units are on a slope, I am in the middle. At the bottom of each enclosed garden wall there is a drainage hole. My neighbour being at the bottom has two holes one at the bottom and another between her and myself. With the rains we had there was terrible flooding. The water from the unit above me was rushing through the drainage hole towards me and in turn was running down until it went through to the unit below me. But water can’t and I noticed that the lasft drainage at the bottom of her yard has been closed with rocks and sand. Now I hear my neighbour is complaining about the water flow so she decided to closed the hole at the wall between her and I with rocks. Which of cause is going to cause major problems, and might eventually cause the wall between us to collapse. Hi Jacqui, This is a huge problem everywhere. According to the regulations the lower property does not have to accept the floodwater from the property that is above it unless this is agreed to with the neighbour or with the local council/municipality. The owner of the property is then (by implication) entitled to block drain holes in the wall. But when it comes to a complex where each unit is walled off then the Designers/Architects/Engineers (competent persons) should have made allowance for this in the planning and building of the complex. The focus of Part R is on the disposal of stormwater on individual sites, but also included interconnected complexes that have multiple dwelling units, including both cluster homes and retirement, village-type properties where management of common property is often controlled by a management body of some sort. I think that you probably need to raise an objection with the complex management or the body corporate and ask them to sort this out. Your last resort will be to have a meeting with your neighbour and come to an agreement with them. When you all agree then this should be put in writing and signed by both parties. I wonder if anyone can help me we had a storm on the 25 July 2016, my flat flooded with suage water as all the drains were blocked on the premises and in the road. When I confronted the owner he told me the Municipality is liable for all my damages, I put in a claim against the Municipality and the report came back stating it is an act of God. I told them that if the drains were not blocked this would never of happened, they came and cleaned up all the drainage with tractore on the 31 July 2016 and until now we have had heavy rain again but all seems fine. In this process I had to get alternative accommodation for myself, and my son and his family. I did not pay rent that month as I did not have the money to do so, We could not live there until we cleaned up as my grand children did not have any clean or dry clothing, bedding and the smell was unbearable, my grand children are 3 years and 9 months they both developed severer diarrhea. Now the owner wants to evict us and the more I try and explain that the property must have liability insurance the less he is listening, the people next door moved as they said this is not the first time that this has happened, the owner is now renervating the flat next door and want’s us out so he can do the same for higher rent. His insurance must of paid out as he did not have money to fix anything when we asked. What can I do as I have to purchase electricity from him and he is making it very difficult to do so. I would appreciate and help on this matter. I live in Winkelspruit another point all the plugs were under water as well and the power did not trip I had to put off the main switch. Surely it is not my responsibility to confront them about regulations? The municipality should have ensured this was done when your neighbour built! Contact the planning department. Hi ,when i moved into my house some 13 years ago ,i had put a wire fence with wooden poles, it was inbeded into hard soil,my neighbour excavated the land making a bank on her side,now over the years sand washed away the bank, my land have washed away some 1 metre away[25th july 2016] with the heavy rains ,whos responsible for this,i spoke to my neighbour to re-enforce her side of the bank,she is not agreeing to do nothing, so i can do my upper side,now the building inspector says i must have a grid with a channel for the surface water to go in,PLEASE give me some ADVISE or ,to which department can help me. It is your responsibility to handle drainage of water from your side. But if your neighbour has done an evacuation that caused the problem, I’d say she needs to sort out the problem. The problem is that maybe it isn’t because of what she did. I have a shower on our roof terrace. The water run off for this is via a drainpipe that also caters for stormwater runoff from the terrace. 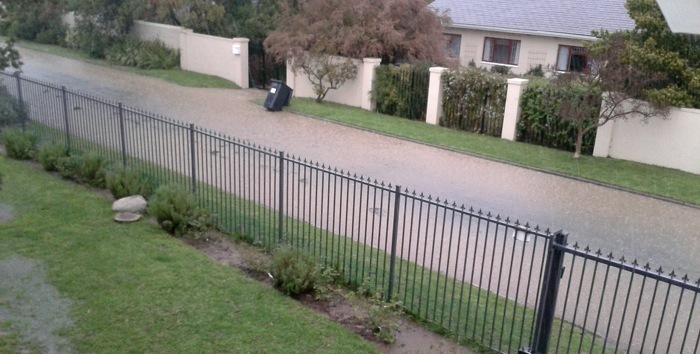 This combined runoff is to a central point on the street (we live in a suburb of Cape Town with no council sewerage/stormwater drainage). My neighbor has an issue (not with amount of water or where the runoff is diverted to but) with the greywater from the shower in the dry summer months. He claims that the water is smelly and is making his dogs,who drink it, sick. Question: is the shower runoff allowed to join the stormwater runoff into the street or do I have to run it off into a separate greywater facility on my property? Good Morning. Any feedback from the moderators? Will greatly appreciate (With thanks to the great voluntary effort that you are both providing). You cannot feed into the stormwater without council permission. You should not be running your grey water into the street! Why not run it into your own garden and use it for plants – maybe a veggie garden? Hi i hope u will be able to help me. My neighbour has done some work to driveway which has resulted in all access water from heavy rainfall to come into our yard. We have tared our yard and allowed for our access water to go down our main drain which works fine until we experience heavy rains which means the excess water from our neighbour is bringing down all the soil from the bank. We have spoken to them countles times to get this problem fixed but they refuse to do anything saying that we must sort the problem out. We did have someone come out from the municipality to inspect their yard and he advised them that they need to sort out the storm water drain especially since they tamperwd with it and thats why the oveflow of water is affecting us. They still refuse to do anything saying that they not going to pay to fix a problem thats affecting us. Please advise on what our next step should be. Drainage is the responsibility of the property owner. Your neighbour may not legally let water drain onto your property! I have written a lot about this on this site, with references to relevant clauses in the regs. You probably need to send them a lawyer’s letter. But is water is running into my yard when it rains and previous tenants built a hole / drain in our wall into our neighbours yard for gravitational flow; is that not legal? I am a trustee for a small complex. The property has an extreme slope from the street entrance all the way down to it’s boundary wall which separates the complex from a row of neighbouring free-standing houses. In turn, these properties, which also slope further down are bounded by a street and a further row of houses flanked by land,extending less than 10 metres leading into a spruit. Originally, there were storm water drain holes in the boundary walls separating the complex and the neighbouring houses. There is a section where water has been accumulating during high rainfall. It seems that previous contractors responsible for maintaining the complex grounds were negligent and there as been a fair amount of growth (duly removed) as well some sections where the holes are above the ground, some silted up and others blocked from growth on the other side of the wall inside the neighbouring properties. 1. Recommended contractors (should I enlist garden landscapers, plumbers/ architects) and experts? 2. Does the City Council provide any assistance and advice, and which department/ designated title would I need to talk to? 3. Various contractors have been approached and their proposals have been so different from each other, making it hard to adjudicate the quotations. 4. I want to re-visit the problem from a fresh start and I am looking for guidelines on how to specify my request for information and scope of work for any recommended contractor to respond to. – No person shall cause or permit stormwater to enter any drainage installation on any site. b) into a suitable surface channel, stormwater drain or natural watercourse. Drainage installations on any two or more sites, whether such sites are in the same ownership or not, may be permitted to discharge into a connecting sewer through a common drain. Information in our section that explains SANS 10400-R, Stormwater Disposal gives substantially more information. Unfortunately we are not in a position to recommend contractors, but you will probably need an engineer to do a proper drainage plan that will then need to be implemented by a qualified, registered plumber. Does the regulation stipulate, that when paving is laid, it must make a dip on either side of the Gardens Gate?? one “dipping” down toward the back of the Property & the “Dipping” in front of the gate facing the drive way???? All the gutters on my neightbour’s large house have fallen off some time ago (2 -3 years). The house is surrounded by concrete paving. When it rains all the water from the roof and from the paving pours into my property and has complelety washed away all the soil. It is now starting to undercut the foundations from the servant’s quarters building. Who do I approach to force the neighbour to repair his gutters, and more importantly to pay for my repairs?? Hi RP, The building regulations stipulate that gutters must be installed on all buildings and the stormwater channelled away to the street stormwater drains so as not to damage any neighbouring property. You must contact your local municipality and speak to the building inspectors to take action. As far as claiming damages this is a legal matter and you will have to consult a lawyer. This sounds like dodgy plumbing Paul. The first thing I would do is check your plans and see if in fact this arrangement is legal. If it is, and if your neighbours are throwing fat, oil and so on down the drain, you need to talk to them about their actions. I would hold them liable for repairs. The council is only liable for their drains, not those on private property. I drained my portable intex swimming pool to correct thé alignment , my drainage systém is well routed to thé outside not affecting any neightbours , láter that day I was confronted by a contractor complaining that my water messed up his tar on the road And that they tried to contact me without any success. No hé is saying that thé tar Will not Last And they need to inform thé local council to close off thé road for repairs again. Can i be held liable for thé damages ? Firstly nobody informed me to stop , although they said they tried by nobody answered, secondly , are they not trying to prolong théir work for extra cash perhaps , using my water as an excusé ? What to do should thé council decide to bill me for damages ? Normally you would drain a pool into a stormwater channel next to the road. I’m really not sure how this is likely to play out – but remember that generally it is better to be sued than to sue! Perhaps you should talk to the council rather than waiting for this “contractor” to persuade them that you are in the wrong. I recently closed up the storm water drains with concrete on the bottom of our walls because of excess water coming from the neighbours, he removed the concrete and the problem is back. What can I legally do? Chris you have no right to close up a stormwater drain. However, if water is draining onto your property from your neighbour’s, he is legally obliged to rectify this. 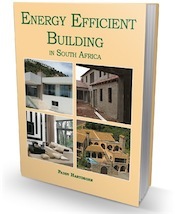 Start by appealing to the local authority in terms of the National Building Regulations and Building Standards Act (i.e. the law) that states: “The owner of any site shall provide suitable means for the control and disposal of accumulated stormwater which may run off from any earthworks, building or paving.” Sans 10400 Part R: Stormwater Disposal provides guidelines of how this can be done. The holes are drainage holes at the bottom of our boundary wall, I closed them off because of too much water coming from the neighbours side during heavy rains. If he is legally obliged to take care of his own storm water, why can’t I close up the holes? My comment was that IF this was “a stormwater drain” you cannot block it. But if it is drainage holes (different entirely) then yes you can.